Put on your pearls and pummel ‘em! - Helen Caldicott, M.D. This was not an anti-feminist stance. Far from it. It was the sign of a smart tactician. Leave the Birkenstocks and the peace sign jewelry at home. Don’t give them what they want. Don’t let them stereotype you. Put on those pearls and then pummel ‘em! Caldicott, probably the world’s most famous anti-nuclear campaigner, has done her fair share of pummeling for the best part of close to six decades. She is 80 now and tired and she wants us to do it. Especially us women. Although she is as disappointed and frustrated as the rest of us that we still have to. We should have won by now, I am sure she would say. I do. In my now 21 years in the anti-nuclear movement I have come across countless people, mostly women, who have told me, “I got onto this movement because of Helen Caldicott. She inspired me.” Usually it took just one encounter, a single speech. Helen had a way of rattling people’s conscience. After listening to her, you couldn’t not join the anti-nuclear movement (against both nuclear power and nuclear weapons.) The alternative was to walk away, remove the mirrors from your walls, and sleep badly the rest of your life. “Damn right,” Helen will answer to that one. What can be more “emotional” than trying to stop a technology like nuclear power that kills babies and children — or, during a nuclear war, everyone on Earth? If you are not emotional about this subject, what does that say about you as a human being? Then, when they get older, women like Helen are not cast by the media as sage elders, the deference typically afforded elder statesmen. Instead, she has had to weather withering and offensive disrespect (I’m talking to you, George Monbiot.) Pearls and pantyhose don’t help then. You have to put on your armadillo shell, become an unflappable punching bag, stick to the truth in the face of the lies and propaganda. That doesn’t mean it doesn’t hurt. No wonder she’s still writing her possibly final book, Why Men Kill and Why Women Let Them. Helen also converted that irresistible combination of frightening facts and colorful rhetoric into books, lots of them, each one more compelling than the last, and written in vivid, highly readable, non-technical language. A book for everyone. For parents. For their children. Through each volume, Helen appealed to the heart as well as the head with everything that is wrong with our endless fixation on the development and use of nuclear power and nuclear weapons, the ultimate testosterone-fueled obscenity. And her most recent: Sleepwalking to Armageddon; The Threat of Nuclear Annihilation. As I said, no mincing of words here. No half measures. Wake up people. It’s going to be too late. Soon. Now. Time to act. It was a book, after all — On The Beach by fellow Australian, Nevil Shute— which drew Caldicott to the issue in the first place. Plus, she trained and practiced as a pediatrician. She sees the issue through the eyes of a medical doctor. She knows whereof she speaks, no matter how hard patronizing commentators like Monbiot try to dismiss her. Caldicott always knew, however, that books and lectures weren’t enough. To empower the movement we needed powerful organizations. She has founded quite a few of them, including Women’s Action for New Directions (called Women’s Action for Nuclear Disarmament when she founded it in 1980), and Standing for Truth About Radiation (STAR), and Nuclear Policy Research Institute, both now closed. * She was a founding president of Physicians for Social Responsibility whose umbrella organization, International Physicians for the Prevention of Nuclear War, went on to win the 1985 Nobel Peace Prize. “STAR put together the first symposium at the Medical Society in New York City,” recalled Mary Olson of Nuclear Information and Resource Service, who has worked alongside Caldicott on and off since 1991. “The subject was low-dose radiation and it had an all-star line-up including Alice Stewart and Karl Morgan,” Olson recalled. STAR also attracted the participation of celebrities Christie Brinkley and Alec Baldwin. Symposia became another passion of Caldicott’s, especially when focused on the medical consequences of nuclear power or nuclear weapons. Two years after the March 2011 Fukushima nuclear disaster began in Japan, Helen’s foundation hosted the symposium, The Medical and Ecological Consequences of the Fukushima Nuclear Accident, at the New York Academy of Medicine, with yet another star-studded line-up. After closing NPRI in 2007, Helen started the Helen Caldicott Foundation for a Nuclear-Free Future. She had hoped all along to create a think tank that would counter the Washington, DC lobbyists and right wing institutions that pump out well-funded propaganda, with a huge and detrimental influence on Capitol Hill. But Helen found, as have we all, that the mega millions don’t flow readily to anti-nuclear organizations. Despite being a consummate fundraiser — in her heyday it was more than rumor that audience members would write five-figure checks after listening to her give a talk— the perpetual grind of fundraising eventually wore her down. Today, she is content with a simple website bearing her name and that promotes her work and that of others. And she is a first class Tweeter. But she’s not done. She has retired — or threatened to retire — countless times. But Helen Caldicott will never retire. She remains our most fearless and indefatigable matriarch. She may want to potter in her picturesque Australian garden, but we still count on her to be there as we march resolutely away from the nuclear abyss. If You Love This Planet intersperses US nuclear propaganda films with a lecture Caldicott gave that year to students of SUNY Plattsburgh in New York. You’ll notice she is wearing pearls. 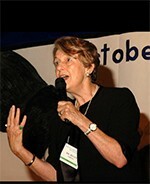 Headline photo of Helen Caldicott courtesy of Physicians for Social Responsibility, taken during the symposium, Nuclear Power and Children’s Health, Chicago, IL, October 2004. * When Helen Caldicott closed Nuclear Policy Research Institute in 2007 she passed the baton — and her 501(c)(3) — to us so we could form Beyond Nuclear. She is our founding president and we could not have made Beyond Nuclear what it is today without that generous transition. Fukushima: “An Ongoing Global Radiological Catastrophe”. “A Huge Coverup”.